I was unable to post our activities the past couple of weeks due to our erratic schedule. We’ve had bouts with fever, cough and colds. I was laden with work due to periodical tests which necessitated more hours of tutorials. Blah, blah, blah… Actually, I just haven’t been managing my time well. 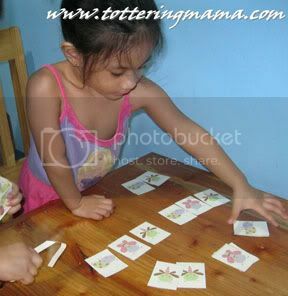 Anyway, we did manage to still have our morning lessons though we were unable to stick to our weekly schedule. But then, it’s just playschool after all so we really shouldn’t mind a couple of missed sessions. 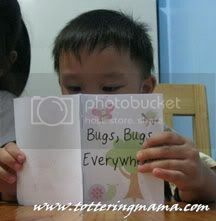 We learned to sort bugs from flowers. We had fun creating patterns using cute bugs. We played with a dice…er, we played with a box. We added new words to our vocabulary. We made our own books and had fun reading them. 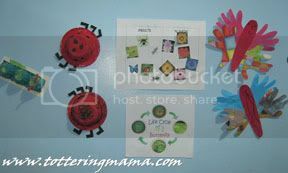 For our arts and crafts, we made lady bugs and caterpillars from used egg trays and plastic bowls. We also made handprint butterflies again. Now our wall is riddled with insects! Our next theme is Pond Life so we’ll be learning about frogs, ducks, and other things we see in a pond. 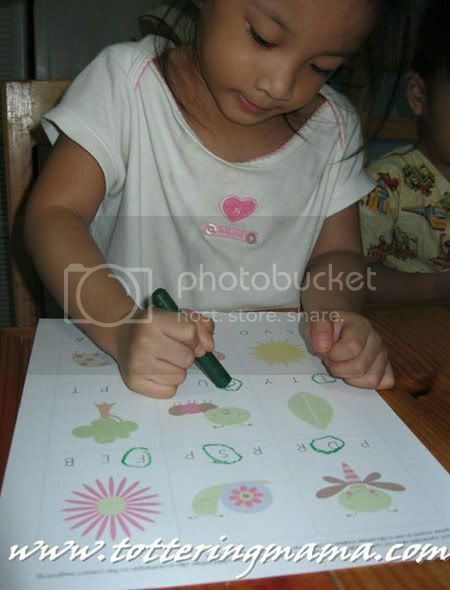 Come visit PLAYhouse preSCHOOL again for more fun ideas for your little ones! It’ll be sooo much fun, Mommy! And, yes, a printer is a must. Good thing printer inks aren’t as expensive as they used to be. ang saya! 🙂 great job mommy! Thanks, Mommy Chris! You were the one who inspired me to “homeschool” the little ones. It’s turning out to be a lot of fun! Great idea. A fun way of learning. Saludo ako sayo! Stopping by from the blog hop and now following you thru GFC and Facebook. I would love a follow back on both when you get the chance. Thanks so very much for your help and have a wonderful weekend! Thank you for the visit! Followed you back already. Such cute kids. Maybe you’d like to post on my blog sometime about activities for toddlers. Following with GFC from FNF Hop, also “Liked” your FB page. Please visit & return the love. Thank you for the visit! Returned the love already. You have a wonderful blog. I’ll be sure to drop by again sometime. Thanks for the visit, Shana! I’m joining your giveaway. I hope I win that iPad!!! Stopping by from blog hop. Your kiddos are ADORABLE! Looking forward to reading more. Thank you for the visit, Robyn! You have adorable Yankees, too! And you are one pretty mom as well. Thank you for the visit, Beth! Your daughter is so pretty and I love the theme of your blog.